Spoken Justice is back for the spring 2019 semester! Come out to Tommy's Place for FREE food, to support the artists and hear some amazing student poetry! Join us on Thursday, January 24! 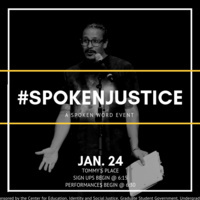 Spoken Justice is a spoken word event with a focus on identity and social justice issues. These are FREE events open to anyone who wishes to attend and/or participate. Sign-ups to perform begin at 6:15pm each event. Don't like to perform? No problem. Come out and support the artists and hear some amazing student poetry! FREE food will be provided by USC Residential Education. This Spoken Justice event is a collaboration between GSG, Center for Education, Identity and Social Justice, and USC Residential Education.